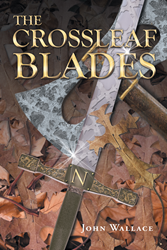 Recent release “The Crossleaf Blades” from Page Publishing author John Wallace is an exhilarating work of fiction detailing the voyage of a soldier guarding the only person who can save their kingdoms from being overrun by evil. John Wallace, a first time author, has completed his new book “The Crossleaf Blades”: a gripping and potent work that will keep the reader on the edge of their seat and their hearts pounding. John Wallace is a self-proclaimed bookworm and book collector who has discovered that writing is even more enjoyable than reading. “The Crossleaf Blades” is his first novel. John currently resides in Tucson with his wife. He has five children, one granddaughter, two dogs, and four cats. He is working on a sequel to “The Crossleaf Blades” and two other books. Published by New York City-based Page Publishing, John Wallace’s thrilling tale will excite the reader. Will Erik Steiner be able to safeguard the only hope the northern kingdoms have of defeating Lord Nakaret while delivering her to her destiny? Erik Steiner, Captain of the Queen’s Guard of Nolvaria, and Aleed Ravenwing, commander of the elite 43rd Corps of the Northern Dwarven Kingdom, are two soldiers who meet on the field of battle and form an unlikely friendship. During the battle with the Vampire Lord, Scapus the Putrid, Captain Steiner is initiated into the company of those who carry weapons known as Crossleaf Blades. In fulfilling a promise to return to the scene of the battle one year later, the Captain receives his own Crossleaf Blades and learns what it truly means to carry such weapons. He soon discovers he is to become the guardian of a strange young girl he names Hope. Hope represents the only chance the northern kingdoms have against Lord Nakaret, the Soulless One, who seeks to overrun the kingdoms with his armies of Undead warriors. The mysterious members of the Brotherhood of the Eternal Light inform the Captain that he must deliver Hope into the very presence of the Soulless One, and only then can she attempt to save the northern kingdoms. Accompanied by Commander Ravenwing, Captain Steiner and Hope begin their journey south and quickly find they are being hunted by the resurrected priests of Lord Nakaret, known as Whispers. Readers who wish to experience this mesmerizing work can purchase“The Crossleaf Blades” at bookstores everywhere, or online at the Apple iTunes store, Amazon, Google Play or Barnes and Noble.